Now Accepting Orders For The 3rd Batch. Delivery: Mid-September 2016. Aquila Boards will shortly begin the equipment production. We have selected the two models that will be launched, The Manta and The Carver. The main reason for this choice has been the tremendous interest you all have shown for these two models through your inquiries. From Aquila we want to transmit with total clarity the approach we are giving to each model and the intent to facilitate a choice for one or the other. 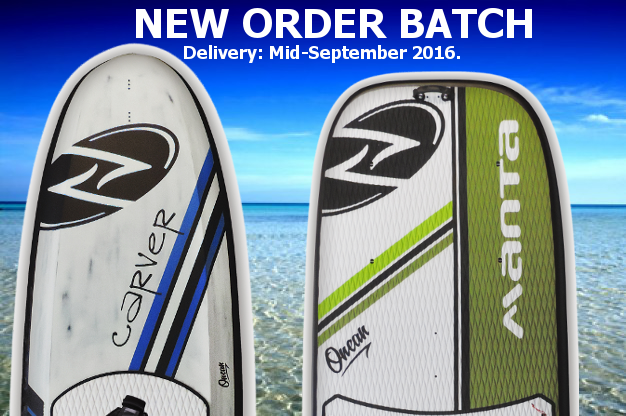 The Carver is your board if you seek speed and the feeling of freedom provided by gliding over the water surface. It´s a board with considerable volume where buoyancy is assured, even with the turbine stopped. On the other hand, this board allows large weight ranges without compromising its gliding capability. The Carver is easy to use and you will enjoy it from the first minute. The Manta, on the other hand, seeks a user wanting to relax venturing into the sea, cruising through rivers, or calmly exploring a lake. This board has a large shape with the aim of maximizing stability and comfort at low speeds. It has an even greater volume than the Carver that allows you to add an extra rider. With the Manta, as we have mentioned in previous posts, the battery autonomy increases considerably (over 2h). Due to the low speeds, the turbine consumes less energy. We would like to ask you all for a little patience. Launching a robust and reliable product is the only way, and being this our main goal, it requires the Aquila team great dedication and time to assure it. Since the beginning, Aquila has presented a product to enjoy speed over water. To make the boards glide has been the main objective throughout the entire development, being the most demanding implementation. Having this solved, in Aquila we are aware that our turbines can bring to live other kind of boards that move below the gliding speed. In this approach we won’t be looking to trigger adrenaline, but to offer a product which will help the user to enjoy water surroundings in a more relaxed way. On the other hand, this board will demand less power and because of this, we will be able to increase its autonomy up to a few hours. Technically, it doesn’t represent a big difference since this approach is presented as a limited power option for higher buoyancy boards. For that reason we will include this model in the first series of production. Over the last few years we have seen how a new boardsport has expanded to our beaches, lakes and rivers. It´s the SUP, a board with considerable buoyancy and a paddle.Something simple, besides de fact that already existed, has amazed everyone with an increasing number of enthusiasts that effortlessly cruise throughout the water surface. From our point of view there are several factors that have contributed to the expansion of this new Sport. In recent years, we have seen how land vehicles have been incorporating electric motors into their designs. Sometimes the result has been a hybrid vehicle whereas in other cases fully electric vehicles have been placed in the market. Although it is still difficult to compete with fossil fuels, mainly in terms of autonomy, it is a fact that electric vehicles belong to a developing sector. Now it is time for marine environment.